Beaded wire trees can be decorative accents for an occasional table or they can pull double duty as a jewelry display stand. Make a beaded wire tree to stand on a stone or wooden base with thin jewelry wire available in an array of colors to suit your home décor. Seed beads or small 4mm faceted beads work beautifully on a wire tree design. Add the beads to the tips of the branches or manipulate the wire into beaded leaf shapes. Get creative with the wire design to create trees filled with or accented by colorful glass beads. 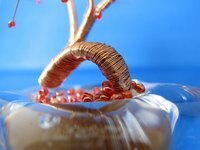 Select a rock with a flat bottom as the support base for the wire beaded tree. If you prefer to use a block of wood rather than a rock, paint the wood to match the wire tree. Rock stores offer stones in a variety of shapes and sizes, but you may also find one on a nature walk. The rock base should be at least 6 inches long by 6 inches wide for a beaded tree that stands up to 15 inches tall. Cut a 4-foot long strip of 22-gauge craft wire. Stretch the wire on a flat work surface. Place the stone in the center of the wire. Pull the two ends up over the stone. Twist the wire together as it meets on top of the stone into a 2-inch long twisted strand. Leave the remaining length of each wire strand separate. Cut a 4-foot long strip of 22-gauge craft wire. Center the wire beneath the length of the stone. Pull the ends of the wire up over the stone. Twist it into a 2-inch strand where it meets in the center of the top of the stone. Leave the remaining length of each wire strand separate. Repeat Steps 2 and 3 four more times. You may need to bend the sections of twisted wire out of your way as you work. The wire will bend back into place easily. Hold the five wire spirals in the center of the width of the stone together and twist to join them together. Repeat this step for the five wire spirals in the center of the length of the stone. Separate each individual stand of wire. You should have 20 wire branches for the tree. Thread size 8 seed beads over the open end of one wire strand. Feed the seed beads to the twist in the wire on top of the stone. Continue to add seed beads up to 1-inch from the end of the strand. Thread on a 4mm crystal bicone bead behind the seed beads. Bend the tip of the wire behind the bead into a loop and feed it back down into the first few seed beads. Twist the wires together at the base of the bicone bead. The bicone bead is the decorative tip of the beaded tree branch. Repeat Step 8 for each wire tree branch. Bend the beaded wire branches into the desired shapes for the tree. Rather than fill the branches with beads, create beaded leaves at the end of each branch. Shape the tip end of a wire branch into a hook. Thread five to seven seed beads over the hook. Twist the end of the wire onto the wire branch just behind the first seed bead, making a beaded circle.